America’s Ruling Class and the Perils of Revolution by Angelo Codevilla. This extensive essay, which covers a number of fronts, provides some essential insights for understanding the global warming scare, its promotion by national governments and international organizations, and why “climate science” focused on catastrophic global warming is a special interest creation/fantasy by and for the “ruling class.” It also provides insight into why non-alarmist, non-ruling-class scientists and spokespersons must be vilified and silenced by advocates for and fellow-travelers of the ruling class in business and government. Once an official or professional shows that he shares the manners, the tastes, the interests of the class, gives lip service to its ideals and shibboleths, and is willing to accommodate the interests of its senior members, he can move profitably among our establishment’s parts. 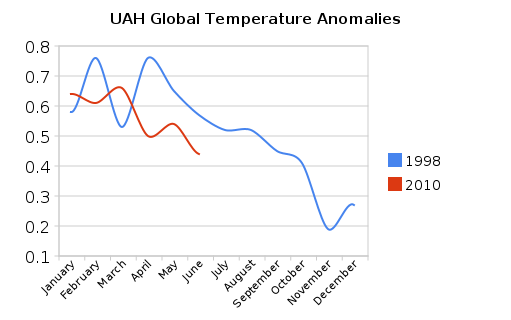 Back in January, our friends were crowing about the warmest satellite temperatures on record. But now they seem to have lost interest in satellites. I wonder why? It probably has to do with the fact that temperature anomalies are plummeting at a rate of 0.47 °C/year and that satellite temperatures in 2010 are showing no signs of setting a record. The Hansen Model: Another very simple disproof of Anthropogenic Global Warming. Dr. James Hansen is the Director of the Goddard Institute for Space Studies. Dr. Hansen is right up there with Al Gore, Michael Mann and the Climategate CRU on the list of people helping the UN to swindle the United States and other western democracies out of trillions of dollars through his promotion of the Anthropogenic Global Warming fraud. Hansen kind of got the ball rolling in 1988 with his publication of a climate model that predicted dire global warming over the next 20 years if mankind did not stop burning fossil fuels… Hansen et al. 1988.
REVIEW OF HEATSTROKE: NATURE IN AN AGE OF GLOBAL WARMING by Anthony D. Barnosky, 2009 (Washington, DC: Island Press) 269pp. In the late 1960s I began studying possible ecological effects of global warming, and first published a paper about these possibilities in 1973. Thus, I have watched with surprise, and sometimes dismay, the sudden development of scientific and public concern over this issue. When I first began to explore the mechanisms by which a trace gas such as CO2 could influence our planet?s climate, getting into the then abstruse topics of atmospheric physical chemistry and energy exchange, there were just a few scientists ? mainly climatologists, meteorologists, and ecologists ? who even knew about the possibility, and even fewer who were doing scientific research on it. The median duration of unemployment is more than twice as high today than any time in the last 50 years. I am for a carbon tax. I also believe that the Climategate emails revealed, to an extent that surprised even me (and I am difficult to surprise), an ethos of suffocating groupthink and intellectual corruption? The American government has suspended its funding of the University of East Anglia?s climate research unit (CRU), citing the scientific doubts raised by last November?s leak of hundreds of stolen emails. The US Department of Energy (DoE) was one of the unit?s main sources of funding for its work assembling a database of global temperatures. Iversen, C.M. 2010. Digging deeper: Fine-root responses to rising atmospheric CO2 concentration in forested ecosystems. New Phytologist 186: 346-357. As the push for binding global targets on anthropogenic CO2 emissions rose to a deafening crescendo — just prior to, during and following the United Nations Fifteenth Conference of Parties (COP15) held in Copenhagen, Denmark, 7-18 December 2009 — two groups of climate alarmists published a pair of papers claiming that even the Intergovernmental Panel on Climate Change (IPCC) had underestimated the magnitude of future global warming that they claim will likely result from the continued unbridled burning of fossil fuels such as coal, gas and oil. 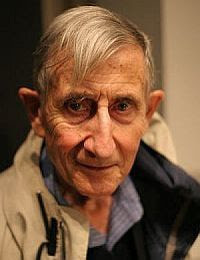 Seven Eminent Physicists; Freeman Dyson, Ivar Giaever (Nobel Prize), Robert Laughlin (Nobel Prize), Edward Teller, Frederick Seitz, Robert Jastrow and William Nierenberg are all skeptical of “man-made” global warming (AGW). Climate Change Scepticism Could Soon Be a Criminal Offence? People who are sceptical of climate change could soon be facing criminal charges in the European Court of Justice, British National Party leader and MEP Nick Griffin has said. A new Government Accountability Office (GAO) report released today found that carbon capture and sequestration (CCS) schemes favored by Democrats under their proposed cap and trade national energy tax boondoggle would increase electricity costs, reduce electricity output and increase water consumption. Sen. James Inhofe (R-Okla.), ranking Republican of the Senate Committee on Environment and Public Works, and Sen. George Voinovich (R-Ohio), released the GAO today covering the status, cost, and reliability of current CCS technology for coal-fired power plants. The release states, ?Based on GAO’s survey of stakeholders, including utilities and state regulators, current CCS technology would increase electricity costs by 30 to 80 percent, reduce electricity output between 15 and 32 percent, and increase water consumption at power plants.? A Review of Garth Paltridge’s Book: ?The Climate Caper? I write this while seated at a table where a certain shop proprietor is happy to stash the bored husband of an enthusiastic shopper. This may seem an odd way to begin a discussion of global catastrophe perhaps, but the incongruity of this mundane snapshot of real life juxtaposed with apocalypse raises a crucial question. Which is more important, the end of the world or a 25% off sale? Formerly I could answer easily, but the shopkeepers have developed an edge that the purveyors of doom have lost. The shopkeepers keep changing their offerings to retain human interest, while their apocalyptic competitors cut their offerings and oversell what?s left well past ?best-before? dates. In fact their offerings have been cut to a single doom. You are currently browsing the The SPPI Blog blog archives for July, 2010.